Ben Duckett returned to form in fine fashion as he led a late-innings charge for the victorious Steelbacks at New Road on Saturday. Duckett, who was out for a five-ball duck in the win against Lancashire two days earlier, blasted an unbeaten 92 from just 54 balls. And his heroics were key in the convincing 24-run win for the champions against the Worcestershire Rapids. Steven Crook excelled alongside Duckett, smashing 34 not out from 19 deliveries as the Steelbacks recovered from 89 for four in the 13th over to post an imposing 195 for four. And the Rapids never really threatened in their reply as the Steelbacks took wickets at key times to keep their hosts in check. Richard Gleeson again bowled brilliantly, claiming figures of one for 23, while Azharullah continued his comeback from injury with two for 37. It provided another vital victory in the NatWest T20 Blast North Group and the Steelbacks now sit second with three games to go. David Ripley's men had headed to New Road on a high after the entertaining success against Lancashire on Thursday night. And they made one change from the team that won that game, with Ben Sanderson replacing Nathan Buck in the bowling department. But it was the Northants batsmen who had to make the early mark on the game after Alex Wakely lost the toss and saw his side sent in at New Road. It was to be a flying start for the Steelbacks as they took a whopping 19 runs from the opening over, bowled by 19-year-old paceman George Scrimshaw. There was a huge chance for a wicket in the second over as Adam Rossington didn't get enough on his effort and Rapids skipper Joe Leach slipped while trying to take the catch. Worcestershire, through John Hastings and Leach, tightened things up and Hastings grabbed a wicket as he bowled Levi for 18. Rossington also went before the end of the powerplay, which Northants ended on 47 for two, as he found the hands of Alex Hepburn on the boundary off Mitchell Santner for 26. 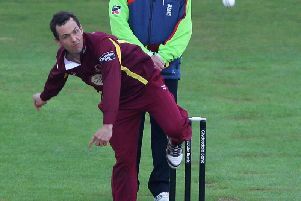 Wakely was given a let-off after Daryl Mitchell failed to take a catch off his own bowling as the Rapids continued to create opportunities. And Wakely went in the next over as he was bowled by Brett D'Oliveira for 10. The Steelbacks were 74 for three at the halfway stage after the Rapids fought back impressively following a hugely expensive first over. The spin was working for the home side and Rob Keogh was next to go, trapped LBW by D'Oliveira for six. The Steelbacks needed something special from Duckett, who had endured a couple of small scares of his own on his way into the 30s. Duckett helped to fight back against D'Oliveira, finding a couple of timely boundaries in the 15th over to set up the final five overs with his team on 112 for four. Crook smashed a six to increase the rate before Duckett reached his 39-ball 50 with a single. With two overs to go, Duckett and Crook had helped the Steelbacks pass the 150 mark - and they continued to take the Rapids to task. The bowlers looked bedraggled and Northants smashed 25 runs from the final over, bowled by Hastings, to complete an incredible recovery. The Rapids weren't going to hang around in their reply, with Hastings sent in as an opener to get the home side off to a flyer. The big Australian hit three boundaries in the opening over, bowled by Sanderson, but Joe Clarke went without scoring in the next as Rory Kleinveldt had him caught behind. Hastings was still at it, firing fours and sixes with alarming ease before Gleeson continued his fine form by bowling the Rapids opener for 35. Ben Cox was next to go, for 10, as Azharullah took the catch off the bowling of Sanderson. The Rapids then started to rebuild thanks to Santner and D'Oliveira, reaching 92 for three at the halfway stage of the reply. But Azharullah was to strike in the next over as he had D'Oliveira caught by Saif Zaib on the boundary for 18. Zaib then took an even better catch, diving to grab the ball on the boundary to help Sanderson dismiss Santner for 38. The Steelbacks were now going for the kill and Ross Whiteley was caught by Wakely off Azharullah for 12. The required run rate was creeping up all the time and the Rapids had few answers, needing 35 runs from the final over to win it. Worcestershire Rapids: Clarke, Hastings, Cox (wk), Mitchell, Santner, D'Oliveira, Whiteley, Leach (c), Rhodes, Hepburn, Scrimshaw. Steelbacks: Levi, Rossington (wk), Duckett, Wakely (c), Keogh, Crook, Zaib, Kleinveldt, Sanderson, Gleeson, Azharullah.